In this review we will cover the SONA anti snoring pillow’s features, the positive points and feedback from users, then the negative points and finally the conclusion. 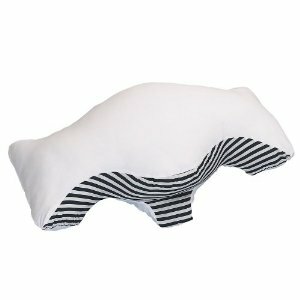 The main function of this pillow is to help people who are suffering from snoring and those who have mild sleep apnea. These 2 things originate from some type of a blockage in the air pathways of the person which makes breathing more difficult and creates noise (snoring). When the person is sleeping in various positions then the air passage way can be increased or decreased, which is exactly how anti snoring pillows help. The pillows align the body in the best possible way to receive the most amount of airflow. 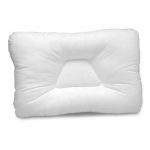 This pillow is filled with SofLoft fiber which provides robust support and allows the pillow to always maintain its special shape. This pillow seems to have a love it or hate it relationship with people as the feedback is often very positive or very negative. We will start by covering the positive feedback first. The first good thing is that it only takes a few days to get used to the pillow, which is actually not such a long time when compared to other devices (like anti snoring mouthpieces). Of course some people are more sensitive than others, so allow a few more days if you are quite sensitive with things. 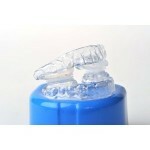 SONA anti snoring pillow can make you avoid surgery or other devices. If you are not suffering from very serious problems the pillow’s adjustment of your breathing can solve your problem so you would not have to wear any devices or go have a surgery. This was actually the case of one person who wrote a very happy 5 star review of this pillow. For some people the unusual shape of the pillow takes very long to get used to. They do not seem to find a way to get comfortable with their new pillow. But when reading into the detail it seems they do not try it for more than a few days. Granted, it is quite difficult to keep forcing oneself to use something uncomfortable, but perhaps the rewards are worth it. Still, some people decide to quit and not bother with the initial uncomfortable feeling. Another negative feedback was that the pillow works while you remain with the pillow on the side and there is no snoring or any problem, but sometime during the night if you shift or toss the pillow and again sleep on your back the snoring would come back. This can be of course rather annoying, but to be realistic the pillow can not control your body and some effort should also come from the person to learn to avoid sleeping on the back which is the position in which snoring is the most frequent. In one case, at the end of their positive feedback on the pillow a person mentioned that it took them about 1 week to get used to sleeping on their side. This proves that it can be done and the snoring problem gets solved by sleeping on the side with the SONA anti snoring pillow. It is really amazing to me when I see so many super positive comments together with very negative ones. 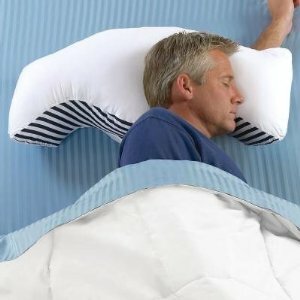 Often I find that by reading and studying everything I am able to understand the reason behind this and in the case of the SONA anti snoring pillow it is very clear to me that the negative comments are from people who expect immediate gratification and do not allow their body a few days to get used to this new pillow which clearly has helped so many people. So my final conclusion is that it is well worth to buy this pillow and do read the instructions and allow a few days, up to 1 week, to fully get used to your new pillow. I also put their official Youtube video below for you to watch if you want. It is a little long though because they explain everything about the pillow, but basically you have all the information in this review. As the SONA pillow is such a non-standard shape you can not fit a regular pillowcase on it, so if you buy the pillow you will also need the pillowcase, which is $19,99 so not a huge amount of money. This is also available from Amazon. It is washable easily and is made of 100% cotton. Although one could get away with not using the pillowcase, just, over time, the pillow would get dirty and $19,99 is an acceptable amount. One could buy 2 of them and use one while washing the other and visa versa.